The First Robotics season is over for 2018, but it’s not too late to write my annual blog about what I learned from building a robot over the span of a couple of months with a bunch of high school students. 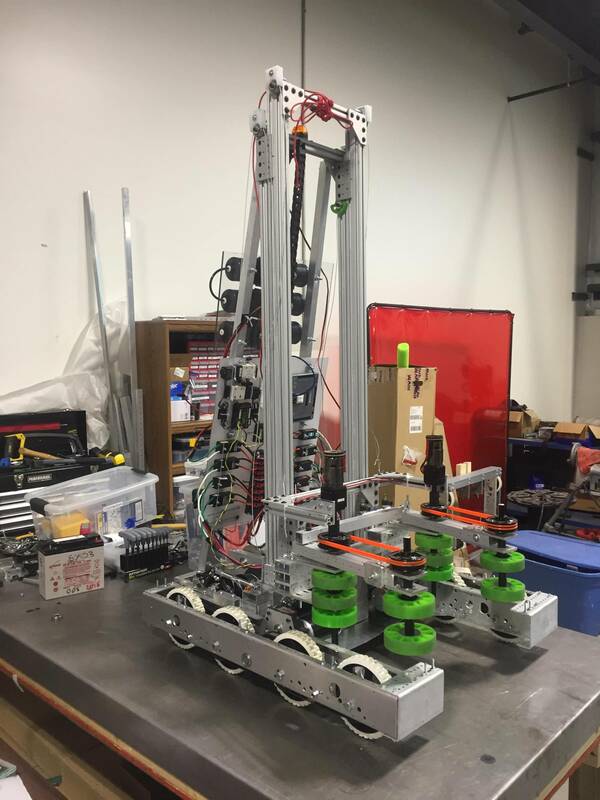 Every year, First Robotics launches a new competition the first weekend in January that culminates in a world championship in late April. Over 3,600 teams competed this year, and each team has about 8 weeks to design and build a robot that will allow them to score points in many ways and win matches. 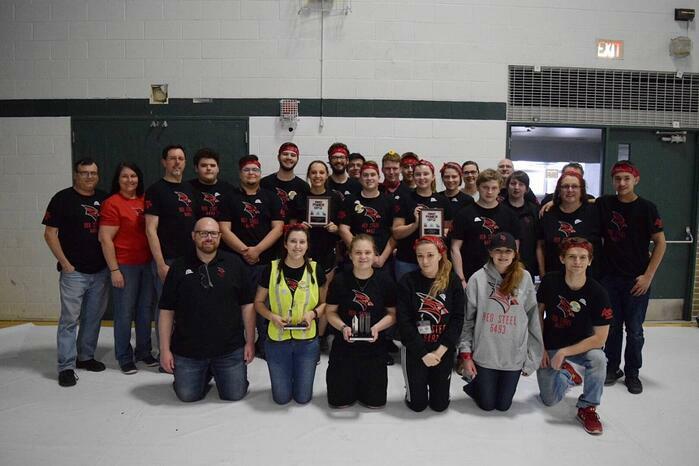 The top robots at regional events advance to the state championship and eventually to the world championship. This gives STEM students a chance to develop teamwork and work on technical and business skills with a championship event of equivalent prestige and excitement as in athletics. In my opinion, it gives students considering a career in engineering the best possible opportunity to explore that career while in high school. This year, we made the decision to combine team 5703 from Midland Academy with Team 6493 from Great Lakes Bay Early College (GLBEC). The two teams had about 20 students and 4-5 coaches/mentors and used WTI’s facility to build the robot. Together, we dissected the game manual, set priorities for our robot design and built a robot to completion. We discussed the pros and cons of various designs, debated design priorities, built prototypes, and continually refined our design as we constructed our robot. Teams can choose to build complex robots that score points multiple ways or focus their design on specialized tasks which usually results in a less complex design. There is a case to be made for either approach, and it is important not to overreach and try to build something that exceeds your technical abilities, build capabilities, or financial constraints. As with any engineering project, the direction you set at the beginning has an enormous impact on the result of the project. We set as goals: to be able to score using the game piece called a power cube (a milk crate covered in a nylon case) in all three potential field locations; to use a drive system with 4 wheels that would provide good torque and speed; and to score points during the first 20 seconds of each match in autonomous mode. We also made it a design priority to keep our important mechanisms inside the parameter of our robot rather than risk damage by extending beyond our envelope since the students from 6493 had some bad experiences with their robot getting damaged repeatedly during matches with this configuration last year. We knew this final design criterion would make it harder to collect cubes from the field, but we thought we could overcome the difficulty with skilled driving and lots of practice. As it turned out, this one decision was the difference between a very competitive robot and a middle-of-the-road robot. In our first competition, our robot performed well once we had a cube, but it took us too long to get each cube into our robot, and we didn’t have enough time for scoring (click here to see a video look for 6493 in Blue). That, along with a couple of other minor problems, caused us to be ranked in the bottom half of robots at the event and miss a chance at the playoffs. We were all disappointed with this result - when we were able to get cubes quickly, we were one of the better robots on the field. We were determined to find a solution to this problem before the next meet. A significant amount of thought was put into how we could change our robot to enable it to reach outside its frame parameter and grab a cube. The rules allowed us 6 hours to work on our robot, as well as 30 pounds of spare parts that we could work on separately. We eventually decided to use a “4 bar Hinge” design actuated by pneumatics to extend past the frame parameter. This let us protect our intake mechanism and extend past our frame, and it allowed the robot to reach higher when placing a cube. We built the system on the workbench and barely had time to install it within the allotted 6 hours, with no time to test it (watch the change here). There were many other things we learned during the season, but I will never forget how much a relatively small change affected our performance. It is important as engineers that we don’t get so attached to our design or idea that we fail to improve or start over if necessary. I saw students and even myself struggle with a concept that wouldn’t work or wasn’t very good instead of rethinking it and being willing to start over. Most of the time, this resulted in us wasting time and money we didn’t have. I hope these students will remember that it is never too late to focus on improvement and that in engineering as well as life, you don’t have to change that much to make a big difference. I also hope that if they choose a career in engineering, they will remember how important the decisions we make at the start of a project can be and how critical it is to set the right design criteria. Finally, I would encourage all of us engineers to remember these basic concepts as we strive to improve our companies and the products they produce.